A camp bunk bed maximizes sleeping space in any cabin, hunting or fishing camp. 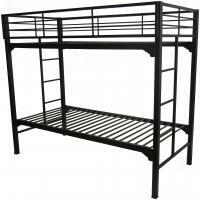 Our camp bunk bed collection features a number of heavy-duty styles and designs. Looking for a camp bunk bed with roll-away wheels for easy transport? How about a camp bunk bed with a ladder and mattresses? 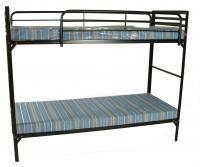 We carry both of those products and more in our large and affordable camp bunk bed collection. Not sure what camp bunk bed is right for you? Call or email our friendly customer service staff and they’ll happy to assist you in finding the right product. Blantex Bunk Bed Ladder, 13.5" x 40"
Blantex Black Square Tube Military Bunkable Bed, 39" x 75"
Blantex Bunk Bed with Built in Ladder, 39" x 75"
The beds are heavy duty but the shorter protective rail falls off far to easily. Had to make it secure with tie raps. Sturdy and attractive. A space saver in a small bedroom. My grandkids love their sleep-overs in these bunks! Adapters connecting top and bottom beds were damaged, but properly replaced. Beds are very good, strong and stable, but mattresses are very thin and need foam pads on top. We just started setting up the beds so far so good. It is easy assembly and no tools needed. It takes 2 people to fold away nicely for storage when grand kids go home. Added screw clamps to each of the four bunking attachments for stability as they were actually bendable and a bit loose, mattresses very thin, added 4 inch foam pads to each. All things considered...good purchase. The bunk beds worked out great for our storm shelter area. They are very well made for the money and your website was great to work with! Army-style is true, emphasis on the "style". 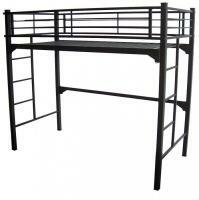 This wouldn't last long in the Army or in an institution, but it is more rugged than your average wooden bunk bed. For home use, I like it. Takes up less room than standard twin bunk. Twin sheets will be too wide but they work. Sleeping two young men (not kids) comfortably.